If you see anyone who was on the river yesterday, and they look a bit red-faced please understand it’s not from embarrassment but the windburn they are likely recovering from. Even though the wind was whipping, the water temps got above 50 pretty much system-wide, and we saw some pretty active fish out there, albeit almost completely subsurface. Those fishing streamers and nymphs found hungry trout almost anywhere they looked. In the lee of the wind you could find some risers sporadically up and down the river, but it was not anything to really write home about. 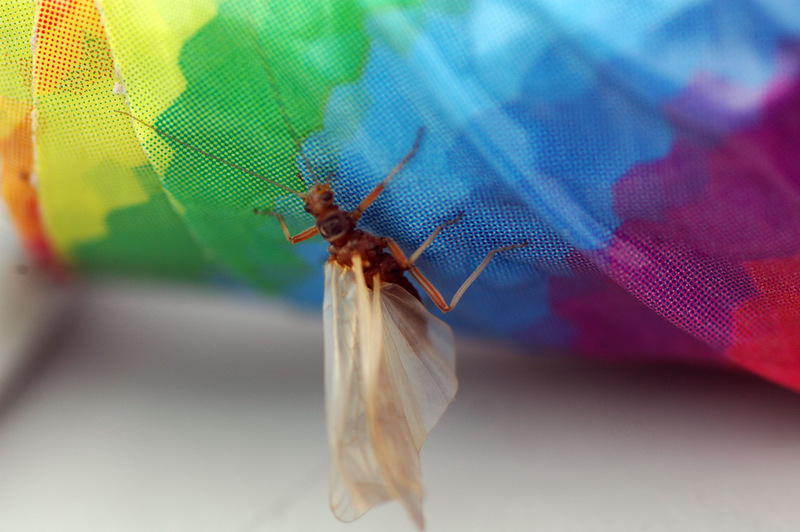 Today we’re looking for a bit more precipitation, but it is coupled with warmer weather, which equates to yet warmer water – exactly what we need to get these bugs moving! The wind is still going to be a factor, but it looks like it will come and go throughout the day (thus far – we’ll see how right the witchdoctors are!) giving us a bit of a break to put on some Chap-stick. UPDATE: Lordville guage is down as of 9:28 AM – so take the flow and temps there with a grain of salt. It finally started yesterday! Well, at least on the Upper West Branch. Lots of Paraleps and Baetis flying around, and fish up and actively eating them (albeit sporadically at times) – our first real good dry fly day of the season. 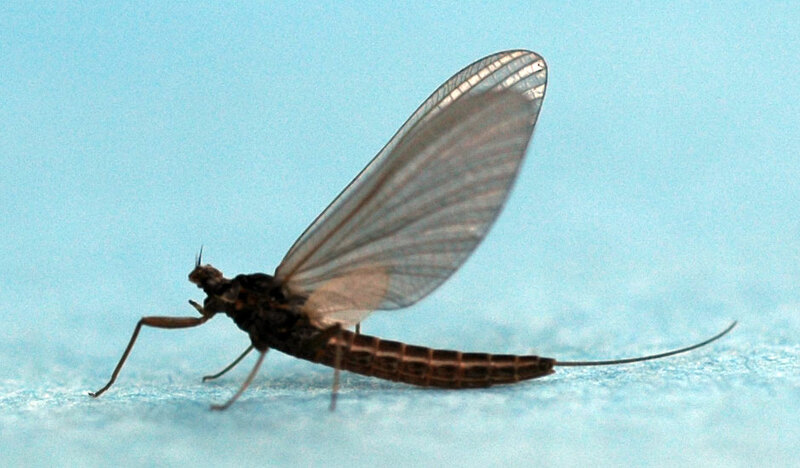 The only downer to that was the Upper West was the only portion of the river really fishing, despite huge numbers of hatching Chimarra caddis system-wide. The good news is, the Main Stem is already above 50 degrees at Lordville, meaning that if we maintain these consistent temps, the dry fly seasons should start in earnest in the very near future. Maybe even today! As far as weather is concerned, we have highs in the 60s today, with some passing showers rolling through as well. Let’s hope they get the rivers back up a little bit! While the thunderstorms went around us, we still picked up some decent rain upstream, which was enough to keep our flows up – definitely good news. The fishing was a bit slow, likely due to the major pressure changes, but there were a handful of times when the fish were very active, and even feeding on top. 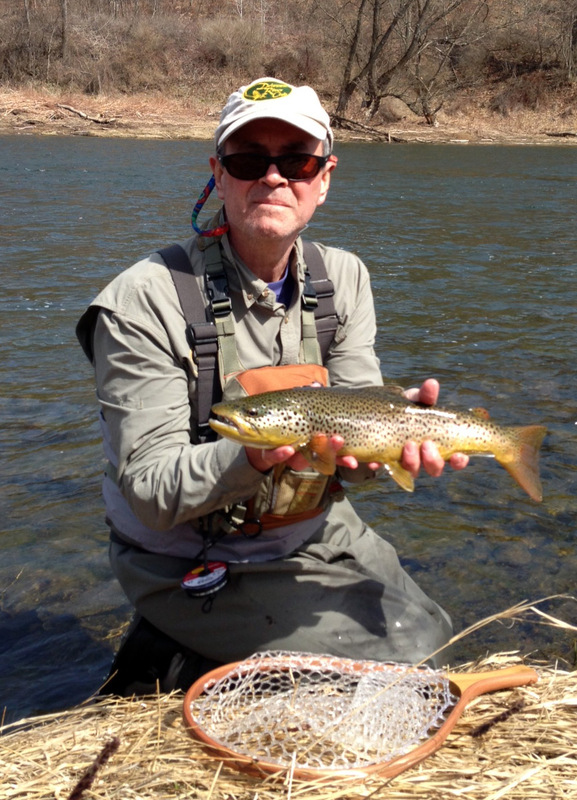 Several nice fish were taken on the lower West and upper Main on Parleps (Blue Quill) as there was a nice little flush of them after the rain in the early afternoon. Today, we’ve got “partly cloudy” skies predicted, which will mean a nice warm-up of the water. The warmer it gets, the closer we are to Hendrickson time! There were plenty of wind-burned faces coming off the water yesterday, that is for sure. On the West Branch, there was no real need to back row in a boat – you could just let the wind take you upstream. 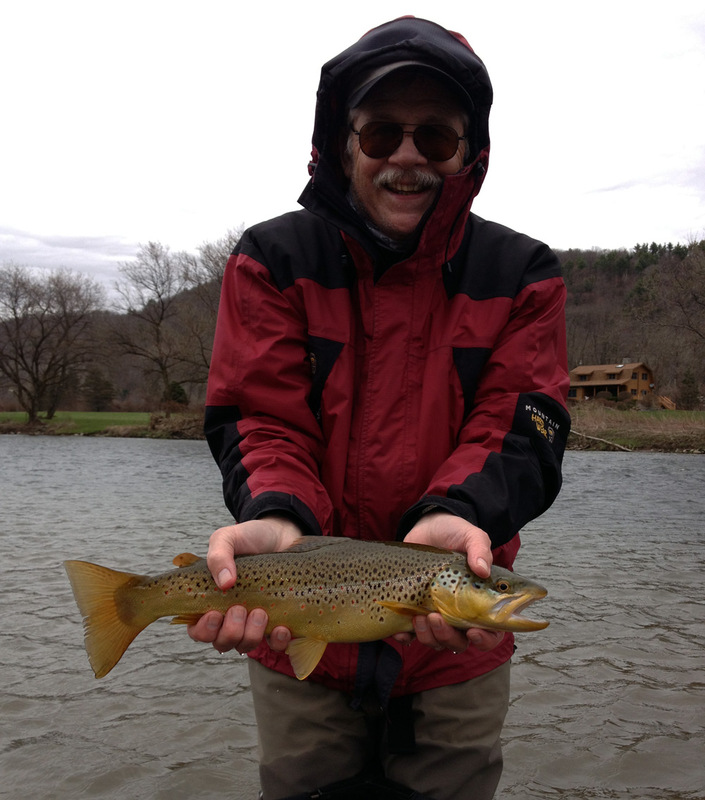 That being said, we had some decent fish caught on streamers, nymphs, and even a few isolated dry flies. 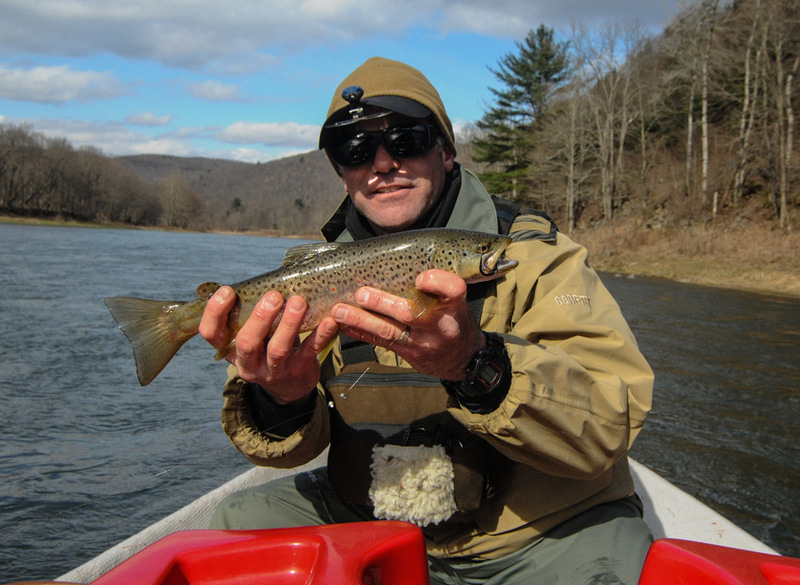 The dries that were around comprised mostly of the chimarra caddis (little charcoal/brown) in about a size 18. There were some (reliable) reports of some strange “Baby March Browns” on the lower West – I’m hoping to capture one today. Could be some that had their growth stunted or the like. Bug-nerd-wise, this is important. Fisherman-wise, not so much as the fish weren’t on them. Today we’re starting with warmer water and air temps – this could bode well for a more dry-oriented day, but there are some thunderstorms predicted, and a little bit of wind (not like yesterday) coming out of the South again. The weathermen did it again. Or is lying just their thing? Regardless, instead of the mid-50s sunny day we were so hoping for yesterday, we had cold weather and some serious breezes, and even SNOW flying around at times. That being said, it sure didn’t hurt the streamer bite at all, with some really nice fish moved throughout the day. There were some decent mayflies spotted on the lower West as well, but no fish were up and chasing, most likely due to the wind masking their presence. Today, we are supposed to get into the 60s with a good amount of sun. Obviously, I will believe it when I see it, but if it does occur the bugs should be happy, and the fish should be active. Let’s see if they get this one right! Yesterday was certainly interesting out on the river. While there wasn’t a ton of insect activity, there were periods of pretty intense action on streamers, then followed by real lulls in the fish activity. There were some nice fish boated, including a few random Smallmouth Bass thrown in for good measure. If the forecast holds for today, we’re looking at some banner fishing most likely – the sun will heat up the water early, and if the winds stay down as predicted, the bugs should be out as well. The water levels are falling, but not precipitously, meaning we will still have some decent floating conditions for the next few days, but keep praying for more rain! It was a little less than pleasant yesterday morning after my post – rain came down in HUGE sheets, then nothing, then HUGE sheets, then nothing then……you get the picture. The good news is that the West Branch was spared much of the run-off, but not so much that it dropped significantly. 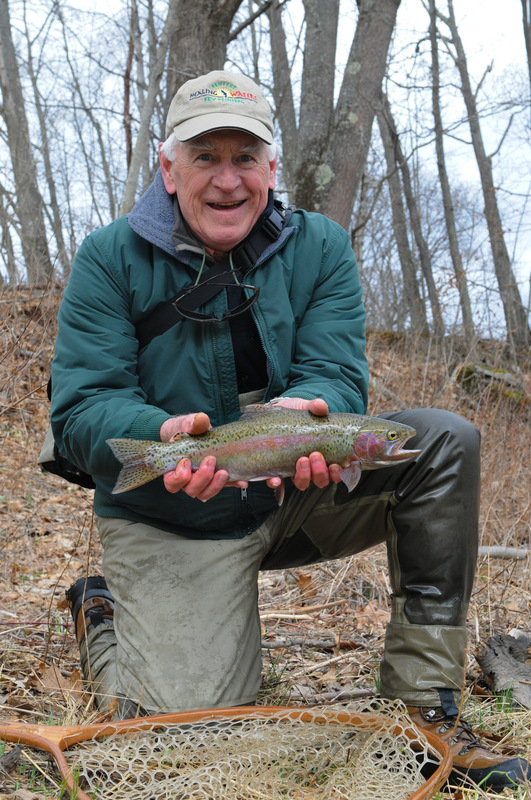 We had some color in the water, but just the right amount – perfect for tossing streamers and nymphs. 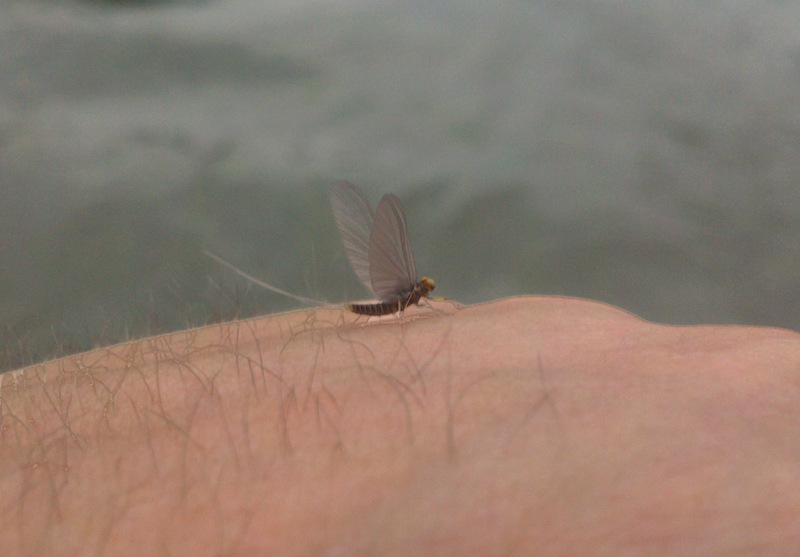 If we had had some warmer weather, I think we would have seen some great dry fly action. Instead, there was a little flush of bugs in the “heat” of the day (when it got to 45 or so), but nothing the fish were able to key in on. Today however, we are looking at temps up in the 50s, with little to no rain. This bodes very well for a productive day, assuming the wind stays down. It also shows promise for an awesome Sunday/Monday – those look like the two days when it could just go ‘off’ here with dry flies….. The rain and cooler temps definitely slowed us down a little bit yesterday, but did great things for our flow situation. The West Branch has stabilized around 750 CFS, and looks like it will hold around that level for the next few days. Great for those wanting to fish upstream a bit. Again, the parts of the West Branch in New York were the only sections with any real insect activity to speak of yesterday. 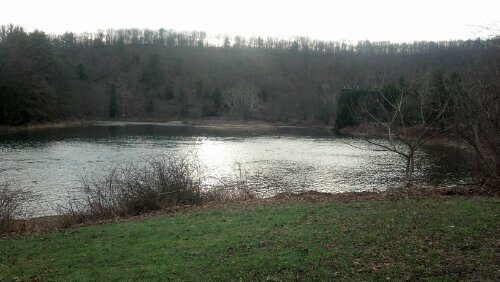 The East and the Main Stem are clearing nicely, but still a bit too high to wade at this point – great for you boat folk! Today is likely going to be a mirror-image of yesterday, with clouds and showers here and there. The air pressure has equalized a bit, so I think that bodes well for us from a hatching standpoint, especially with water temps all starting above 40 this morning. UPDATE: The West has gotten a little bit of color since this morning, but is by no means blown out. The rain we have been hoping for finally made it. That being said, the Beaverkill and East Branch seem to have taken the brunt of it, making two big jumps in the last 36 hours. As such, the East and Main are pretty much blown out – they will likely settle throughout the day, as the flows decrease, and the rain lets up. 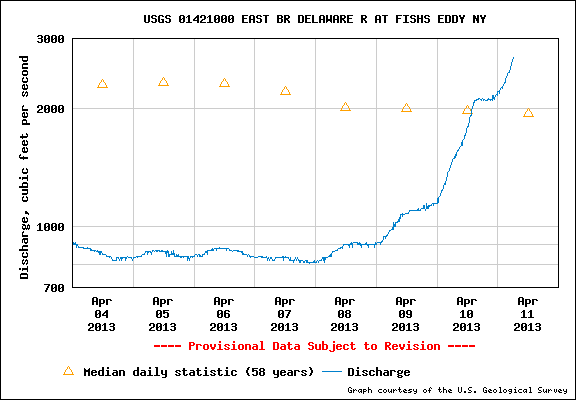 The West Branch was spared, but did make a nice jump up over 1000 CFS at Hale Eddy, but leaving us nice and clear. We’re already dropping, but Home Pool is still probably around 1,200 CFS. If this decline is gradual, we could be set up for some great fishing in the coming week & weekend. 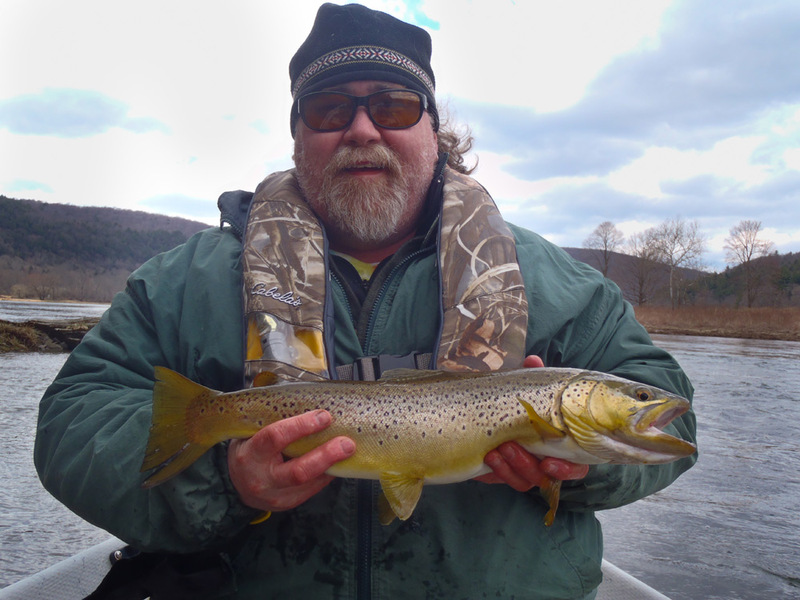 Fishing was slow yesterday, and the bugs didn’t really come out to play, except for the upper reaches of the West Branch (No-Kill section). The air pressures have calmed down, and with little wind predicted today, we could be seeing some decent activity on that front. Otherwise, it at least LOOKS like perfect olive weather up here with overcast skies, and tons of humidity. Yeah. The East Branch jumped a little. Ok, that was weird. With the weather the way it was yesterday, I (and everyone else, judging by the plethora of phone calls) expected it to be a banner day for both bugs and fish. Instead, it ended up being one of the slower days thus far. Every now and then when you think you have this thing figured out, Mother Nature has to drop you down a peg! Last night we had some serious (albeit brief) rain come down, and push the flows up a tad. The water temps remained steady, which was definitely a boon. The lower river has warmed up in-line with the upper portions, so we should start to see bugs hatch river-wide – when they decide to. Today is a wild card – it’s our first cloudy day with decent air / water temps – could be great, but after yesterday, I’m not putting any money down yet! We’re definitely looking down the barrel of our first truly warm day of the year today, and with temperatures in the water already starting in the mid-40s, we’re likely going to have a great day of dry fly fishing out on the water today. Yesterday saw smatterings of fish feeding on top system-wide, with most being fairly irregular when it came to their rises. No real steady guys, but that also was a result of not-so-steady hatching. That’s a nice way of saying that the stoneflies and caddis were out, and they never do anything ‘regularly’ on this system. 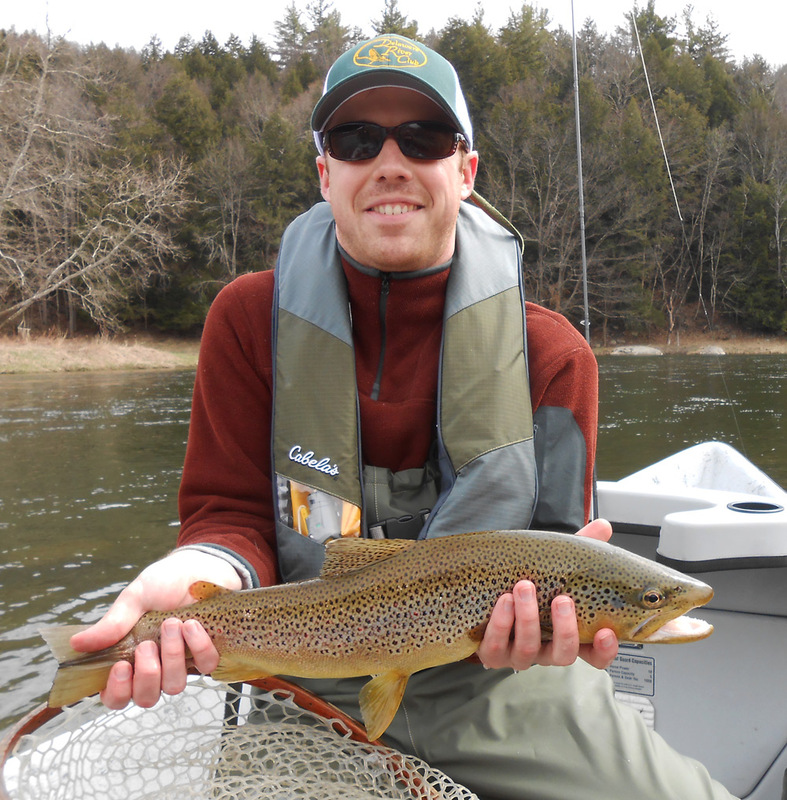 The warmer temps are definitely going to start pushing the mayflies to hatch, and don’t be surprised if you see some odd ball early guys out there – Hendricksons, and even March Browns. This won’t necessarily signify that they are starting, but are instead a product of the super-early season last year. We’ll definitely have a few broods in selective places hatching a bit off-schedule. We will definitely let you know when those guys start in earnest! Another breezy day out on the water yesterday, but there were definitely fish rising the in the lee of the wind, chasing stoneflies and caddis. 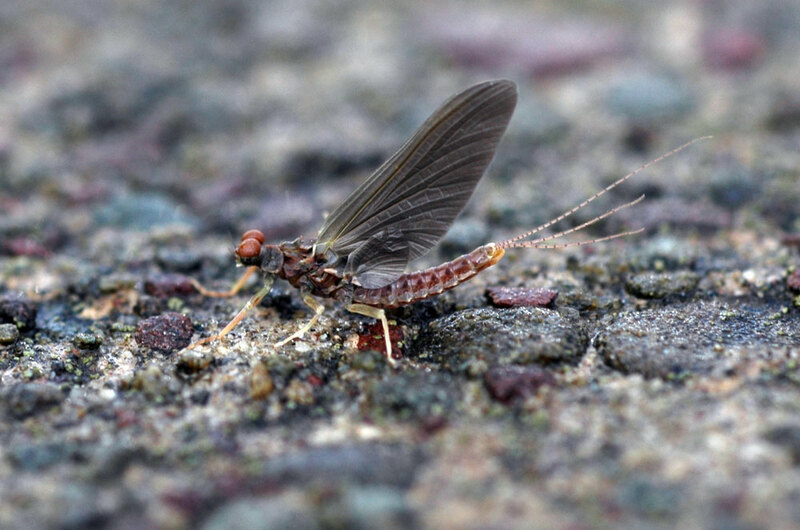 We also had our first small rush of mayflies when the water temp got up into the low 40s – some small baetis (BWO) and Paraleps (Blue Quills). With water temps starting higher today, and warm weather persisting through the week, we should start to see them all get popping very very soon. Baetis species – #18 – COMING SOON!